NO MORE CORK Floats on our Leak Gauges. Krueger Sentry Gauge has a newly designed HDPE Plastic Float that is going to be in use on all of our Leak Gauges moving forward regardless of gauge size. In the past, the only float available for our larger leak gauges was a poly coated cork. This cork presented several problems in the field, especially since the advent of some of the new fuel blends. Now we have a newly designed, oversized, plastic float that has enough buoyancy to float even our largest Leak Gauges. This news is especially important for our Florida customers, where the FDEP would not allow the use of Cork. The new plastic float is now the standard material on all interstial leak detection gauges. The new floats have not affected pricing either. As you know, we pride ourselves on our products being manufactured in the USA. Not only that, but we also source all of our components from US manufacturers. This policy has not changed with our new plastic floats, which are sourced and manufactured in the USA. As always, Simple, Durable, Inexpensive, Easy to Use. The new solid glass gauge display offers the same or better physical durability as the original plastic tops. However, this new glass gauge top offers much better resistance to sun damage, heat, weathering, chemical fumes, and more. The new glass gauge top eliminates the discoloration and cloudiness that can sometimes occur with the original plastic tops. It also will not warp, no matter how much heat and sun you expose it to. Currently, this glass option is available on three models. The Type D At A Glance Direct Reading Gauge, the Type H Therma Gauge, and the Type K At A Glance Leak Gauge. The oldest most reliable mechanical gauge on the market just got better. As always, our gauges and all the parts on our gauges are Made in the USA. Krueger Sentry Gauge has added a new Option for the liquid level Therma Gauge. The exposed calibration on top of the gauge is now available in an ALL GLASS OPTION. Our new level gauge calibration is made of thick/durable glass. 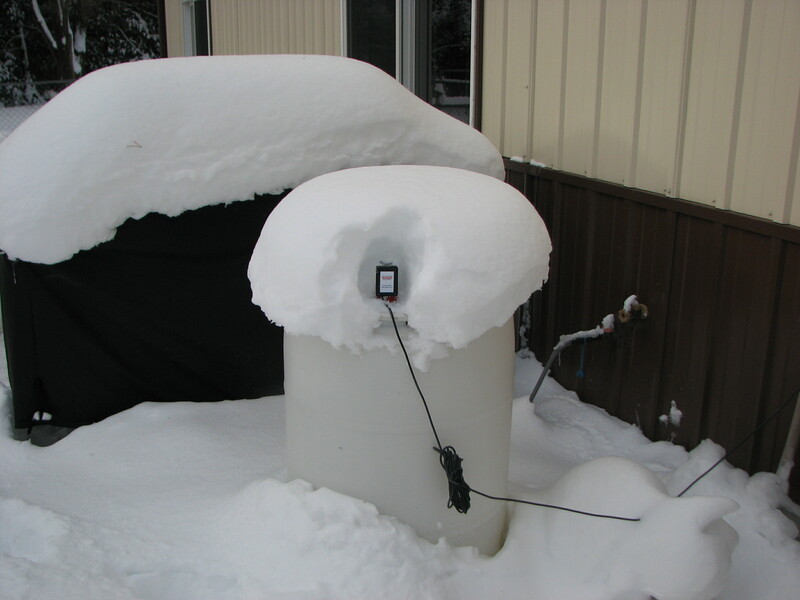 This will make the gauge more durable when it is outside and exposed to the elements. No more cracked, cloudy, warped, or discolored plastic tops. This new glass gauge will hold up to virtually any amount of sun exposure and heat. Order the new Solid Glass Calibration as either an add on option for your new gauges, or order the Solid Glass Repair Kit to upgrade your current gauge in the field. Currently this new glass level gauge is only available for the Krueger Sentry Therma Gauge model Type H (other models coming soon). We hope to have the new product in hand and ready to supply to you by February 1st, 2015. A small quantity of samples are available now to distributors upon request. Any other questions? Contact Lee Geurts at Krueger Sentry Gauge. PDF is a check list provided by The Montana DEQ for AST self instpection. Krueger Sentry Gauge can provide a high level overfill alarm (both visual and audible) to notify the person filling the tank that the fluid has reached 90 percent. This should satisfy step eleven on the inspection shee. See example products and documents from our website. Diesel Exhaust Fluid Article- Don’t Turn a DEF ear to low DEF. Diesel exhaust fluid (DEF for short) is becoming more common as a key ingredient in diesel engine emission controls. Introduced to North American car drivers in certain Mercedes vehicles in 2006, it spread to the heavy trucking industry in 2007. Now DEF has hit the Detroit Three light truck market. Ford, GM and certain Dodge diesels trucks come with an extra tank to carry the DEF necessary to meet emission regulations (the Dodge Ram 2500 and 3500 series meet the regulations without a DEF system). DEF is essentially a 32-per-cent urea-water solution that is injected at a variable rate into the vehicle’s catalytic converter to reduce nitrous-oxide (NOx) emissions. The amount injected is calculated by the main engine computer and varies dependent on engine load and speed as well as operating temperatures and several other in-puts. DEF is used, on average, at a rate of three per cent of the amount of fuel consumed. When the DEF stream hits the hot inner surfaces of the catalytic converter it vaporizes and decomposes to form ammonia and carbon dioxide. The ammonia is then used to convert the NOx emissions to harmless nitrogen and water. For those who think the system is just another piece of technology that can be ignored, think again. If a DEF tank is left to run dry, the engine will not start. If the tank runs low while the engine is running, a series of warning messages and lights will appear on the instrument cluster but the vehicle will continue to run until it is switched off by the driver (and then of course it will not restart). DEF on-board tanks will hold about 30 litres of the fluid. Four-litre jugs can be purchased from most aftermarket parts stores or dealerships (that sell DEF vehicles) for around $12. In the U.S. many heavy truck refuel-ling centres dispense DEF at bulk pumps next to regular fuelling stations for as little as $4 U.S. a gallon. 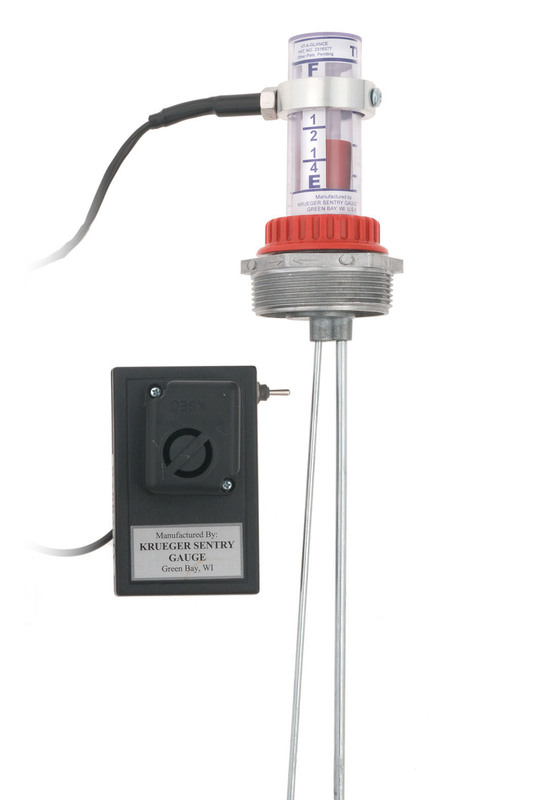 Krueger Sentry Gauge manufactures a simple liquid level gauge for above ground bulk storage tanks that works great with DEF. 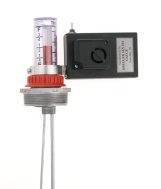 This is the standard Therma Gauge Model designed to measure liquid level. The base construction for this sight gauge is galvanized wetted rods with HDPE Floats and an Aluminum Bushing. Other options are available for increased compatibility with various liquids. Visit the Standard Therma Gauge web page for more info and documentation. Overfill Gauge Alarms – New Options Available. The Audible Alarm accessory for the Krueger Gauge line of products has become a hot selling item. Able to provide audible overfill protection or audible low level warnings, it is a convenient and inexpensive solution. In response to feedback, we are now offering the Overfill Gauge Alarm in several new configurations. All of the configurations are available in both our remote mounted versions and direct mounted versions. DAlarm-FL and RAlarm-FL : With this model, the audible fill alarm is replaced with a flashing light. The flashing light will trigger with the magnetic sensor in the fill gauge and continues to flash until reset. Dalarm-FL-TO & RAlarm-FL-TO : With this model, there is an audible alarm, a flashing light, and a time out feature. When triggered, the alarm will sound for 20 seconds, then it will silence itself and chirp every few seconds. The flashing light will go until reset. DAlarm-DC-FL & RAlarm-DC-FL : This gauge alarm replaces the audible alarm with a set of dry contacts and a flashing light. The light will flash until reset. DAlarm-DC-FL-TO & RAlarm-DC-FL-TO : This version has dry contacts, audible alarm, flashing light, and a time out feature. The alarm itself will shut off after 20 seconds and begin to chirp until reset. The flashing light will go until reset as well. The LED At A Glance, a remote display accessory for the Krueger line of liquid level gauges, has been put through some rigorous weather tests and has passed with flying colors. 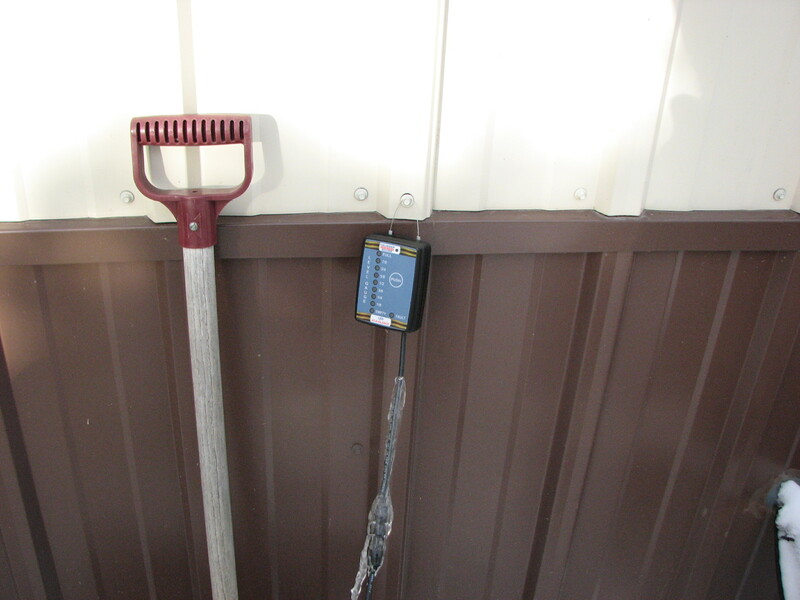 Early in the winter season, we set up some liquid level gauges outside the shop mounted to some 55 gallon drums. The wires for the remote level monitors were then run over to the wall and the LED At A Glance remote level gauge displays were then set up in exposed areas. Luckily, (for our testing purposes anyway), we got hit with a major snow storm. (18 inches of snow, 20 below zero with windchill). Pictured above (the first picture) you can see the exposed remote display wire encased in ice. Pictured directly above, you can see how the remote liquid level monitor itself was totally buried in snow and then dug out. Although we do suggest placing a hood or some other sort protection over the level monitor, in all testing cases the remote liquid level monitor still worked great after the storm went through. You are currently browsing the archives for the Product Specifics category.